With origins dating back to the early seventeenth century, the Second Great Classified Growth Château Léoville Poyferré is one of the most prestigious properties in the Saint-Julien appellation on the Left Bank of the Bordeaux region. Under the control of the Cuvelier family, Didier Cuvelier took over the reins of the Saint-Julien estate from 1979, and since then has run the estate with masterful hands. Great wines come from great terroirs. Bordering illustrious neighbours like Châteaux Latour, Pichon Baron and Léoville Las Cases, Château Léoville Poyferré is famous for its terroir. The fine Garrone gravel soil give the vines the perfect conditions to produce exceptional wines. From the vineyard to the cellar, Château Léoville Poyferré wines reflect an ongoing quest for perfection. Moments after the harvest, the berries are carefully handled with the greatest respect for the terroir so that the wines can convey the unique identity of the Médoc. Michel Rolland keeps a watchful eye on the parcel vinifications so that the most beautiful expressions of each variety and each plot are gently extracted. 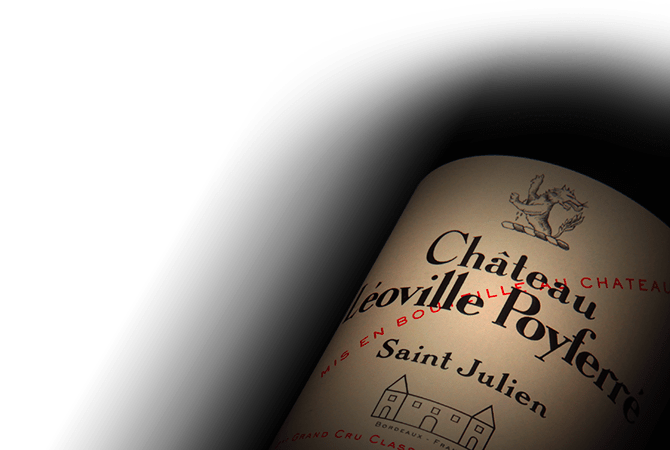 With the purity of fruit and the harmony of oak ageing, the wines of Château Léoville Poyferré offer a bouquet with a broad spectrum of aromas and subtle spice. With wines from an exceptional terroir, this gem of Saint-Julien sparkles with its elegance, finesse and depth that all contributes to the balance and power of the wines. Château Léoville Poyferré are perfectly expressive in their youth, but they can also evolve superbly over the years.